Remember in my last post how I said I went with a smaller size on this one so it’d be easier to finish? Well then I decided to quilt it with about a bazillion straight lines, so easy and quick it was not… four nap times and one trip to the store for Morgan and Max, while I hurried to quilt the last of these lines! 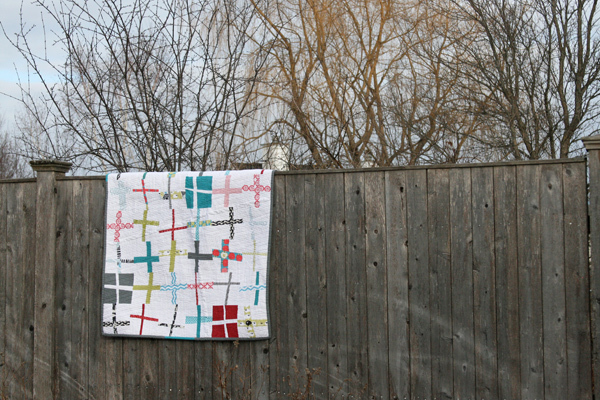 I wasn’t sure how I wanted to quilt it, but then I read this post by Angela (part of a weekly series of posts on deciding what to quilt) where she talked about leaving some areas unquilted. It reminded me of a mini quilt I made a while back where I left an unquilted zig zag in the white space. I decided to try it again on this quilt, so I drew out a big wonky plus over the entire quilt and then I densely quilted each of the four quarters. Since there’s a lot of white on the front, I decided to use big sections of the prints on the back. I like seeing big portions of these fun Monaluna prints, especially those sheep! I’m not sure yet where this one will end up, though it would certainly be perfect for a little boy or girl so I’m sure it will find a good home! This entry was posted in [search] Wonky/Improv Quilts, Posts about Quilts, Quilts and tagged baby quilt, handmade, monaluna, plus quilt, quilt, taali, wonky cross blocks. Bookmark the permalink. I read allll of your posts and hardly ever comment. I LOVE the quilting. I can totally see it. Love it. Love it. Love it! Wow, that’s a lot of lines but they add so much to the quilt. Worth it, in my opinion! You can definitely see the plus – so cool! Awesome quilt!! Wonderful fun quilt and GREAT quilting Ashley! I am in love with this quilt. Inspiration behind my next one!! Great work! 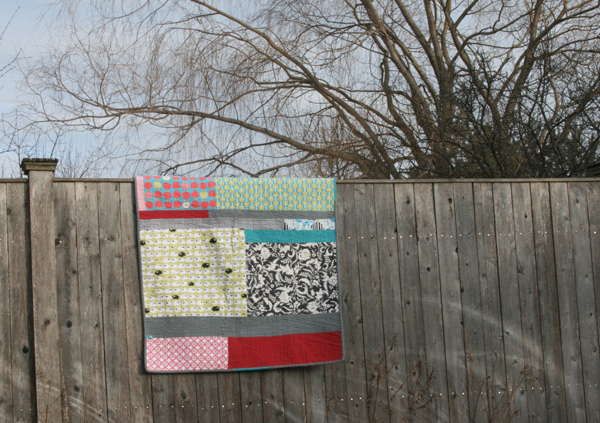 I like this quilt – especially the prints used for the backing. The stitching is definitely worth the effort. 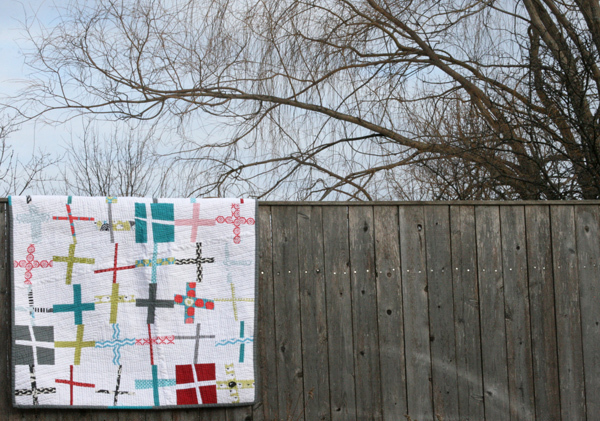 The sacrificed nap times were well worth it…lovely quilt! I think it looks great! I definitely noticed the quilting. I think it’s very subtle, but adds a little something extra above just straight lining it. Good job! Fantastic!!! 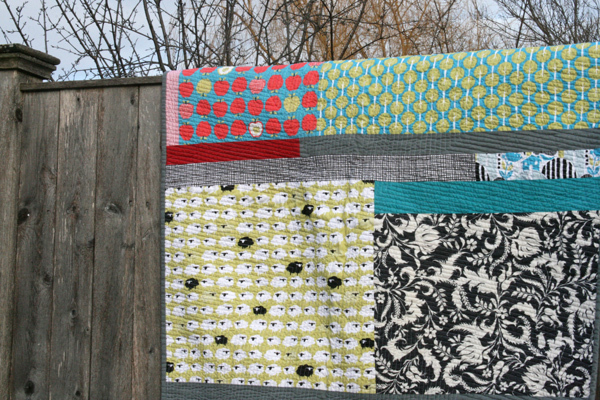 I love how you quilted! Thanks for the link to blog too!!! I love this collection, I just love the sheep! 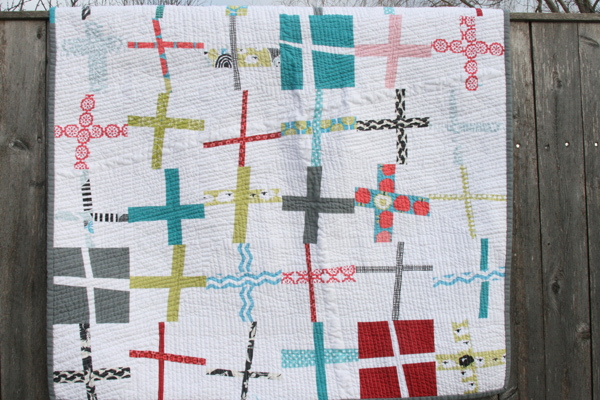 I love this quilt….Really catches my eye….in such a wonderful and wonky way….gotta try one too. thanks for sharing yours….Well done!!!!!!!!!!!!!! I fell in love with and have collected scrap pieces which I intend to use to make a baby taali quilt for a friend. Can you tell me how many squares are used in the design, and their size. Australia is a long way from USA but through the internet some of your ideas are very interesting.